They say the prices are cyclical, like they are for all vegetables. They say India grows enough vegetables to provide for our growing population and we have enough surplus to export. Well, if that’s so, then why does a kilo of tomatoes today cost fifty rupees? A few phone calls and visits to local grocery shops (not the supermarkets) confirmed that today, in Bangalore, Mumbai and New Delhi, tomatoes sold for Rs 45 to Rs 55 a kilo. 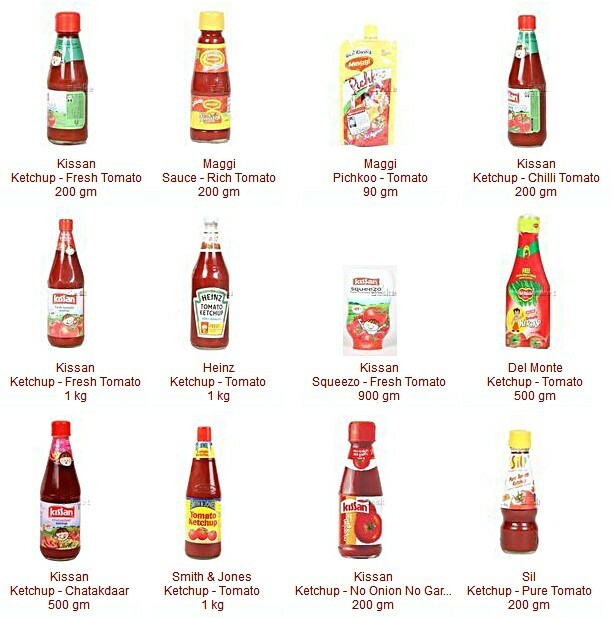 Sauce and ketchup every which way you look in sizes from 90 grams to 1 kg – that’s where India’s tomatoes are going. 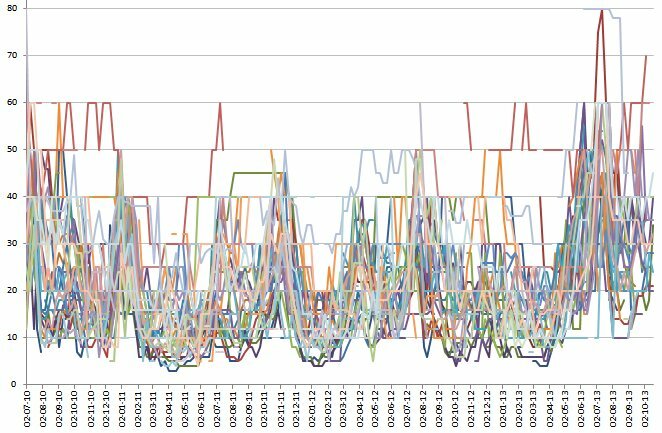 Why are our staple vegetables experiencing such price spikes so frequently (the big onion panic is not two months old)? Here’s what the official numbers look like, from the Ministry of Agriculture, Directorate of Economics and Statistics, Retail Price Monitoring System. 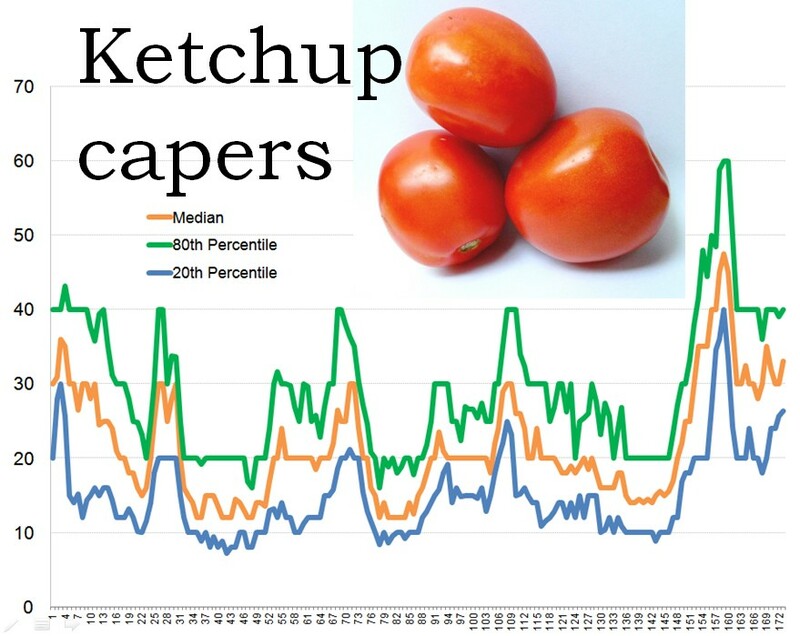 This collects prices of food staples every week from 87 urban centres in all 35 states and union territories, and I have used this quite comprehensive data series to examine the ups and downs of the price of the tomato. The chart above illustrates the price of a kilo of tomatoes in India’s urban centres between the first week of July 2010 and the third week of October 2013 – tomato prices have been recorded for 59 urban centres over 173 weeks. To simplify what is otherwise a maniacal tangle of individual threads (see chart below) I have taken a median price, and urban price at the 80th and 20th percentiles, which together describe the overall movement and variation well enough. The cycles are indeed visible – they are roughly 40 weeks long. Tomato prices recorded for 59 urban centres over 173 weeks. But the cycle changed from the first week of April 2013, when the prices of a kilo of tomato rose more steeply than before. And from the first week of August 2013, tomato prices have settled at a new plateau significantly higher than at any time in the last three years. Why has this happened? The growth of the processed foods industry is the main cause – this industry sector has for the last three years grown (in value) at around 15% per year, which is greater than the GDP ‘growth’ and greater than the growth in value recorded for agriculture in general. For tomatoes, this means that every quarter, more tomatoes exit the stream of tomatoes that would otherwise go to home kitchens and instead enter factories, there to be turned into sauce, ketchup, purée and powder (which you find as flavouring even in those awful noodle ‘tastemaker’ sachets and cup noodle containers). 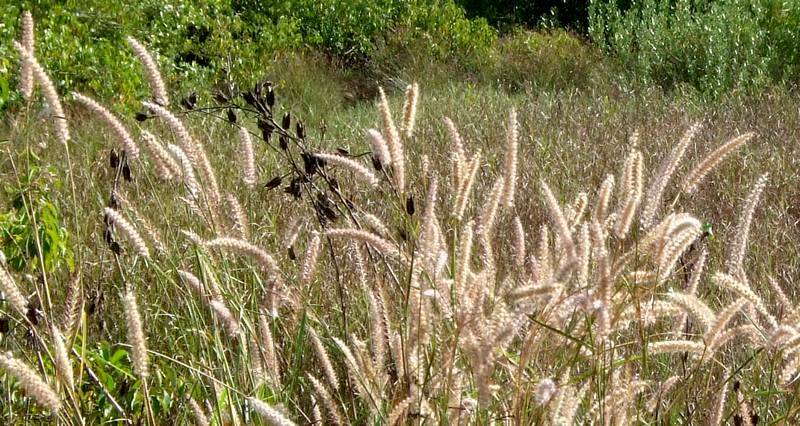 These thousands of tons will become available as packaged and processed goods (the better to accompany the acres of super-fattening industrial pizza being baked every day) and this means less, per capita or per household, is available as primary produce that can be used in kitchens at home. 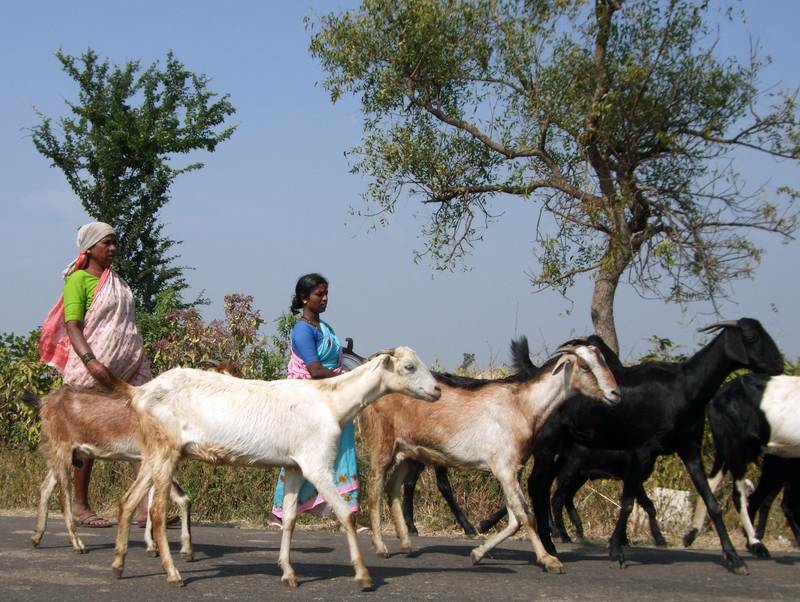 Reports on the new evidence of price increases for staple foods in India have evoked surprise and a variety of responses from economic analysts. Reuters has reported that inflation “unexpectedly hit a seven-month high in September as food prices climbed” because the “wholesale price index (WPI), the main inflation measure, climbed to 6.46 percent last month”. If tomato, potato and onion show the behaviour of all vegetable prices, the new food inflation peak is no surprise at all. Supplied by the views from the financial markets and industry sources, and supported by a government position of prices and food supply that is predictably optimistic, reports in the mass media claim that inflation is expected to come down in coming months. Business Standard reported that “the simultaneous rise in WPI- and CPI-based inflation in September can be explained by the lag effect of rising food prices on consumer prices. The newspaper quoted a chief economist of the State Bank of India who said: “Consumer price inflation is correcting the huge gap we had witnessed in food items at retail and wholesale levels in the previous months.” It also quoted an economist with a credit rating agency, CARE Ratings, who said the divergent trend in July and August could be explained by the fact that retailers couldn’t increase prices at the same rate as wholesalers and, therefore, had to squeeze their margins. The Hindu reported that “headline inflation unexpectedly touched a seven-month of 6.46 in September riding on the back of a whopping 323 per cent increase in price of onion followed by all round hike in price of other fruit and vegetable items”. This newspaper said that the latest data released by the government on Monday put the food inflation at 18.40 per cent in September over the same month last year. The three pairs of charts you see here describe the prices of tomato, potato and onion as recorded by the retail price monitoring cell of the Department of Consumer Affairs, Ministry of Food and Consumer Affairs, Government of India. The cell collects retail prices of 22 food items from 57 urban centres, and these are the monthly averages from 2009 January to 2013 September. 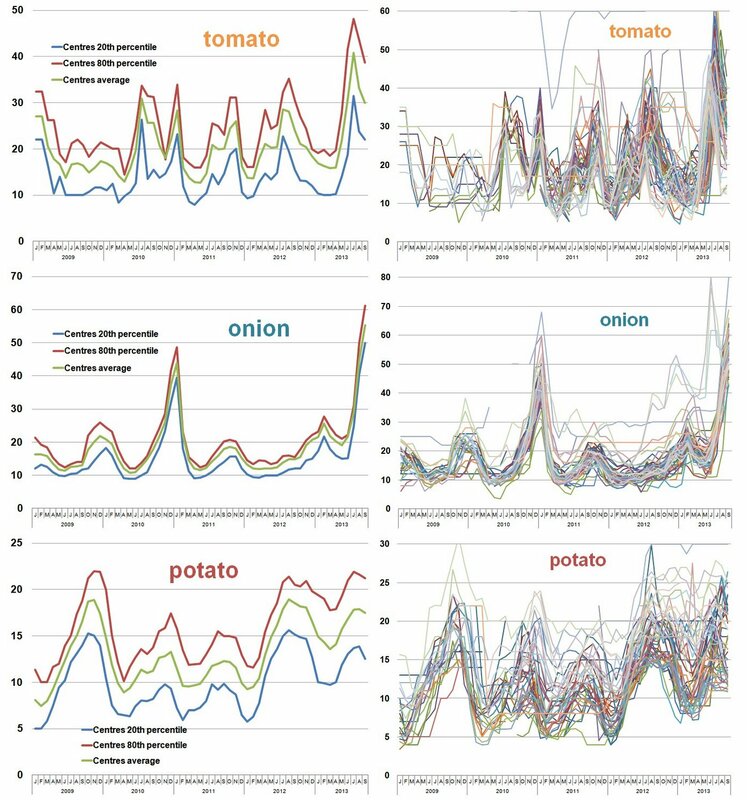 The monitoring cell does not collect the prices of common vegetables (such as brinjal, cauliflower or pumpkin) or leafy green vegetables, hence these will serve as indicative proxies that describe the movements of vegetable prices in Indian urban retail food markets over the measured period. The charts with the full set of price trendlines for all 57 centres are dense to look at, hence I have simplified them to three trendlines each: an average, the price of the 80th percentile of the centres, and the price of the 20th percentile of the centres. Doing so helps preserve the overall trend over the period measured and also helps more clearly display the difference between the upper and lower bounds of the variation in price amongst the set of urban centres. The tomato chart shows periodic spikes from mid-2010 however the peak of 2013 July dwarfs all others. The potato chart shows the previous peak being during 2009 October, but in terms of the persistence of high price the period from 2012 August till the present is the longest since 2009 January. The onion chart records the previous spike during 2010 December to 2011 January, which has been topped during the current spike that began in 2013 June. The tale of the charts is that even for items that go through cycles, like vegetables, the overall trend is upwards and this upward trend is at a rate faster than the wage increases for agricultural and rural labour, for those working in the informal urban sector, and is a rate that is only partly offset by any dearness allowance (if that old mechanism is still used). For all those who are said to be knowledgeable on food price and the causes of inflation – the ministries of agriculture, of commerce and of food processing, the industry associations, the bankers and financiers, the food and retail industry – the current food inflation spike is no surprise at all, it was expected as the festival season has begun. The difference now is that with every such season, the new base price for our food staples is pushed to higher level, further squeezing household budgets that are not reinforced by bonuses. The cereals, oils and sugars have been far more predictable in their rise for the last five years. Their price rise in inevitable given the growth of the retail food industry, the processed foods industry, the rise in the price of fuel, and the rise on the prices of fertiliser and pesticides. Just as the so-called ‘carrying cost’ of PDS foodgrain is derided as being inefficient by the private sector, they too bear a carrying cost – inventory of processed food and inventory of primary crop used for such food – which is concealed in the price the consumer pays. It is only local food networks that choose organic crops, supply locally and insulate themselves from the organised food profiteers that can free themselves from the pain of India’s steadily rising food price inflation.